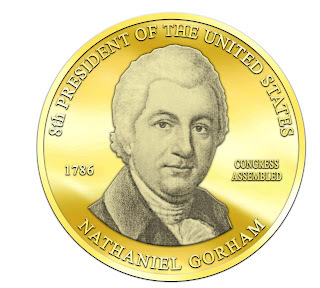 Nathaniel Gorham of Massachusetts was elected President of the United States, in Congress Assembled June 6, 1786 and served until November 13, 1786. He was born in Charlestown, Massachusetts on May 27th, 1738 and died there on June 11th, 1796. He was the son of a small boat operator growing-up in a family of modest means. After receiving a public school education, Gorham worked in various small businesses in his birth ­place of Charlestown. 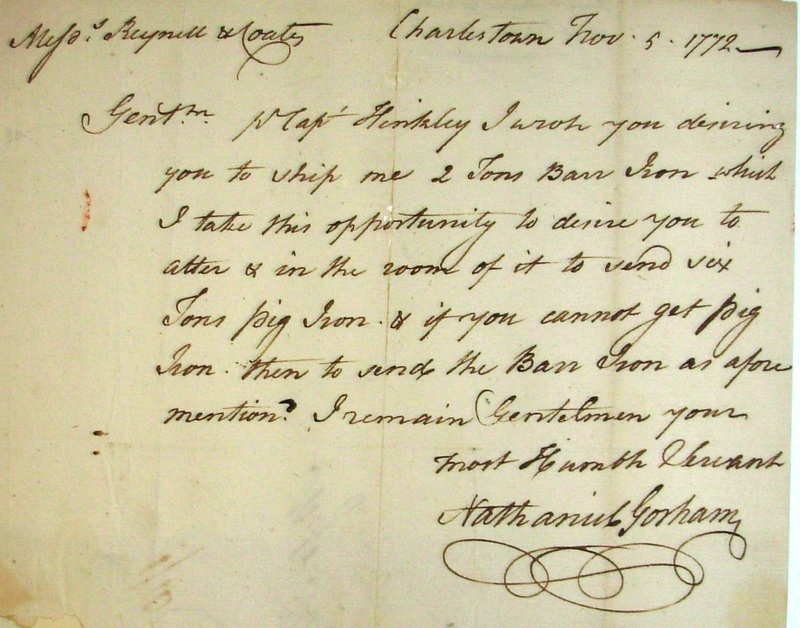 He was apprenticed in 1754 to Nathaniel Coffin, a merchant in New London, Connecticut where he learned the import and export business. 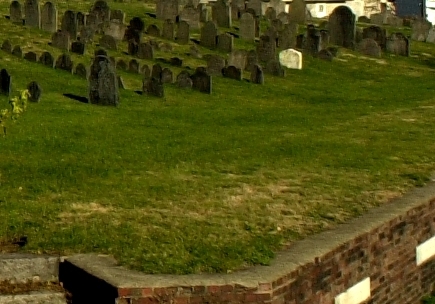 He left Coffin's employ in 1759 and returned to Charlestown establishing his own small business there, which prospered in the post French and Indian War market. Gorham was elected delegate to the Massachusetts' Provincial Congress in 1774 and served throughout 1775. During the war he was a member of the Massachusetts Board of War from 1778 until its dissolution in 1781, which oversaw the State's military strategy, logistics , recruitment and coastal. He help plan the military and naval effort where American forces were engaged in several important expeditions against British bases in Nova Scotia. He paid the price for his efficient service when British troops confiscated or damaged most of his property during their occupation of Charlestown. In 1779 Nathaniel Gorham was chosen a delegate to the Massachusetts Constitutional Convention and that fall he was placed on a committee chaired by John Adams assigned the task of drafting the new Constitution. The Constitution's Preamble states that "The body politic is formed by a voluntary association of individuals: it is a social compact, by which the whole people covenants with each citizen, and each citizen with the whole people, that all shall be governed by certain laws for the common good." "All men are born free and equal, and have certain natural, essential, and unalienable rights; among which may be reckoned the right of enjoying and defending their lives and liberties; that of acquiring, possessing, and protecting property; in fine, that of seeking and obtaining their safety and happiness..."
NATHANIEL GORHAM'S COPY OF AN IMPORTANT BROADSIDE AUTHORIZING A NEW STATE CONSTITUTION. 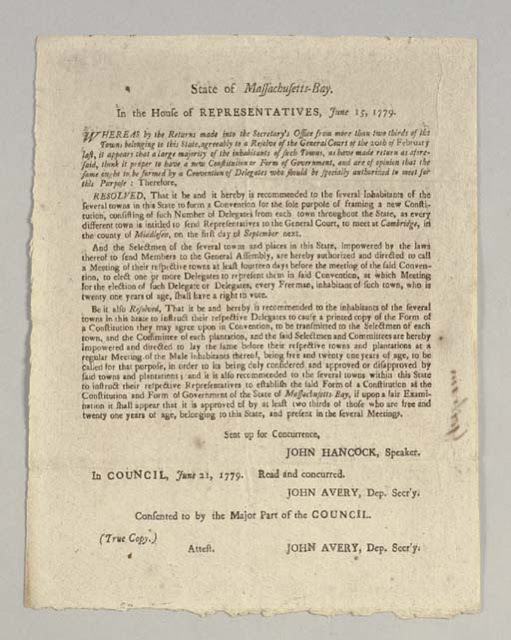 By this resolution, "read and concurred" 21 June 1779 and signed in type by Speaker John Hancock, Massachusetts formally authorized the drafting and adoption of a new Constitution. The act directs that delegates are to be chosen in each jurisdiction to attend a constitutional convention which will draft the new constitution. In electing delegates, "every Freeman...twenty one years of ago, shall have a right to vote." The act also provides for the ratification of the constitution, once drafted, again specifying that "the Male inhabitants...being free and twenty-one years of age," shall vote to approve or disapprove the proposed plan of government. In the same year Nathaniel Gorham was elected to the state senate and served until 1781 and was thus elected to the 1782 term of the USCA. By 1786, he was revered by his fellow delegates as an experience and judicious member of the USCA. The 1785-1786 session of Congress had been the strangest session in the Articles of Confederation's USCA since its incep­tion in 1781. John Hancock, the duly elected President since November of 1785, had not even made a passing appearance in New York to assert his position as the President of the unicameral federal government. Moreover, despite an absence spanning five months, President Hancock did not tender his resignation for a term that was constitutionally limited to one year. David Ramsay, brother of Nathaniel Ramsey and a Delegate from South Carolina, had reluctantly agreed to serve as the USCA Chairman while Hancock prepared his Boston household for the move to New York City. Six months later, Ramsay still found himself in the Chair and on May 15th resigned the office as his credentials as a delegate of South Carolina had expired. The delegates turned to Hancock's friend and fellow State representative, Nathaniel Gorham, to assume Ramsay’s duties as the USAC Chairman. 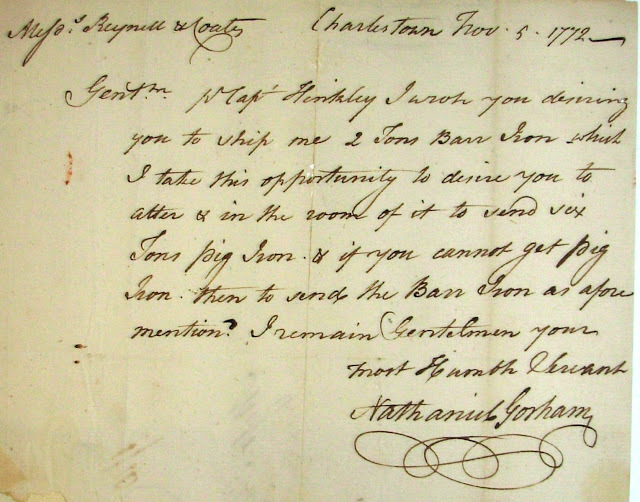 USCA Resolution Recording Nathaniel Gorham as Chairman "in the absence of his excellency, John Hancock, our President" dated May 17, 1786 five days after Ramsay's resignation as Chairman. Historians were once fascinated with the idea of monarchical tendencies in the United States, seizing upon a number of statements and rhetorical flourishes gleaned from the correspondence of several founding fathers. As [Rufus] King and his col­league Nathaniel Gorham had been linked with such sentiments, Edmund C. Burnett discussed the issue at this point in his edition of congressional correspondence, explaining that 'King's remark is one among many indications that the idea of estab­lishing a monarchy in America was in circulation at that time, although perhaps only in whispers.' Burnett, Letters of the Delegates, 8:459n.3. The research, however, indicates these claims to be unfounded especially of President Gorham who played a major role in framing the Constitution of Massachusetts in 1779. He also chaired, on frequent occasions, the Constitutional Convention of 1787 and signed the final document. The chief sources cited in this thesis can be found in Richard Krauel's, "Prince Henry of Prussia and the Regency of the United States, 1786." As some circumstances will put it out of my power to act as a judge for the decision of the controversy between the States of Massachusetts & New York, I take the liber­ty to present thro' you my resignation to Congress. But at the same time that I with­draw myself from this office, it is with particular pleasure that I assure your Excellency, of the high sense, & grateful regard I bear to the States who have conferr'd this honor on me. Three days later, on May 18th, Nathaniel Gorham made the decision to postpone the September meeting of agents to negotiate a settlement to the Georgia-South Carolina boundary dispute. Debate then turned to Connecticut's cession of their claims to the Northwest Territory. The abandonment of all state claims, encumbering the Northwest Territorial lands, was paramount to transacting federal land sales with clear and marketable titles. Consequently, the debate over Connecticut's land claims cession lasted until May 26th when the parties declared a conditional acceptance. The USCA, also during May, took up the issue of coinage and the establishment of a mint but the resolution failed. Mr. Hancock has sent his resignation as President and Tomorrow I suppose Mr. Gorham will be elected his successor. You understand the meaning of this Appointment as well as I can explain it; no State is here from New England except Massachusetts. Present, Massachusetts, New York, New Jersey, Pennsylvania, Maryland, Virginia, North Carolina, South Carolina and Georgia; and from New Hampshire, Mr. [Pierse] Long, and from Delaware, Mr. [William] Peery. Congress proceeded to the election of a president and the ballots being taken, the honble. Nathaniel Gorham was elected. Deficiency in the funding of the Federal government continued to plague the United States throughout the Presidency of Nathaniel Gorham. The unsettled economic conditions were manifested in the people's distrust of socially prominent politicians. The laws passed by the "Carriage Class" were perceived as being grossly unfair to farmers and working people throughout a nation paralyzed by war debt. Hundreds of letters poured into Congress complaining about excessive taxes on property, polling taxes that prevented less fortunate citizens from voting, unjust rulings by the common plea courts, the soaring costs of lawsuits, and the lack of a stable currency all landing on President Gorham’s desk. Oddly, nowhere was this anger more conspicuous than in Gorham's home state of Massachusetts. The States were also all in difficult war debt positions attempting to raise capital by selling land which gave rise to border disputes. Gorham's home state of Massachusetts was in a bitter dispute with New York as each party claimed the other was selling their State lands at the expense of each other's citizens. The Massachusetts population had increased to 270,000 people but the debt ballooned from .42 pounds in 1775 to 11.30 pounds per person in 1786, a 270% increase! Additionally, inflation on both federal and the states paper currency was rampant. The time was ripe, especially with John Hancock dashing their hopes for recovery by failing to take office in 1785, for a rebellion and Massachusetts became the epicenter of citizen protests that threatened a second revolution. The federal government's finances and the weak federal constitution provided neither Gorham nor anyone else with power to rectify the situation. Maryland and Virginia, in an attempt to eliminate trade barriers and spur on entrepreneurship, held the Mount Vernon Conference in March 1785. This conference achieved an accord on the maritime use of the Chesapeake Bay, fishing and harbor rights, criminal jurisdiction, import duties, currency control, and boundary issues resolving many important issues but only between the two states. The success of this interstate diplomacy prompted James Madison to draft a resolution, in the 1786 Virginia legislature, to invite all the States to a second conference dealing with domestic and foreign trade issues that were stifling any hope for a national recovery due to the ineptness of the USCA. It was Virginia's hope that such a conference would result in the empowerment of the federal government with the authority to improve commerce and levy reasonable tariffs to retire the mounting public debt. I am perfectly satisfied that this demand of M[ Schweighauser will be found, on due enquiry, to be right ; and that this worthy Gentleman who has been long injuriously baffled of his honest demand plainly against the will of Congress, will now be fully paid by the effectual measures that Congress in their wisdom and justice shall direct. Despite the former President’s plea, Congress could not act because the federal government was insolvent. Franks, David, The New York directory for 1786 listing the members of Congress, addresses of President John Hancock, Secretary Charles Thomson and numerous officials serving in the Federal Departments of Foreign Affairs, War and Treasury. National Collegiate Honor’s Council (NCHC) Partners in the Park Federal Hall Class of 2017 in front of Fraunces Tavern, which is a national historic landmark, museum, and restaurant in New York City, situated at 54 Pearl Street at the corner of Broad Street. 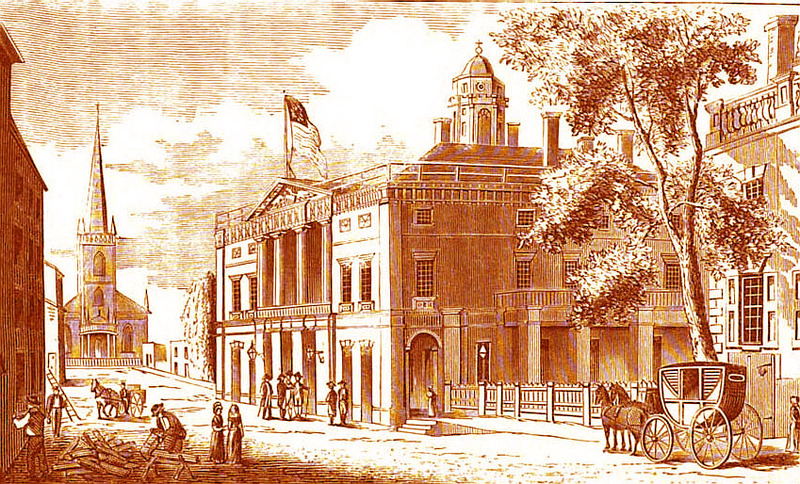 The location played a prominent role in pre-Revolution, American Revolution and post-Revolution history, serving as a headquarters for George Washington, a venue for peace negotiations with the British, and housing federal offices in the Early Republic under Nathaniel Gorham's Presidency. The picture is flanked with Andrew Cuevas in the Tavern holding an April 1, 1786, USCA Secretary Charles Thomson letter transmitting the USCA Journals and legislation to Governor Samuel Huntington in Connecticut. - For more information visit our National Park and NCHC Partners in the Park Class of 2017 website. 1. The existence of the State Senate 2. The present mode of State representation 3. The officers of government not being annually dependent on the representative of the people, in General Court assembled, for their salaries. 4. All civil officers of government, not being annually elected by Representatives of the People, in the General Court Assembled. 5. The existence of the Court of Common Pleas, and General Sessions of Peace 6. The State Fee Table as it now stands 7. The present mode of appropriating the import and excise. 8. 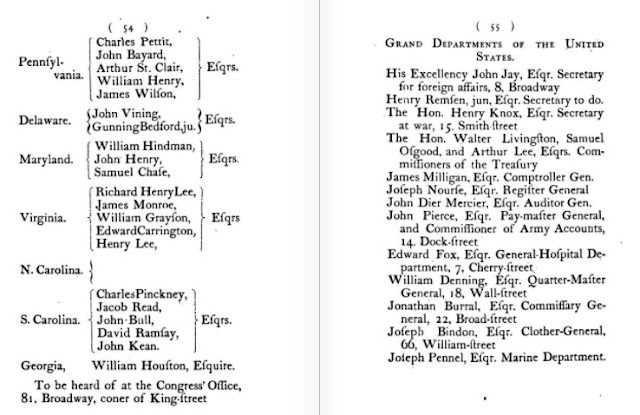 The unreasonable grants made to some of the officers of government. 9. The supplementary aid. 10. The present mode of paying the government securities. 11. The present mode adopted for the payment and speedy collection of the last tax. 12. The present mode of taxation as it operates unequally between the polls and estates, and between landed and mercantile interests. 13. The present method of practice of attorneys at law. 14. The want of a sufficient medium of trade, to remedy the mischief arising from the scarcity of money. 15. The General Court sitting in the town of Boston. 16. The present embarrassments on the press. 17. 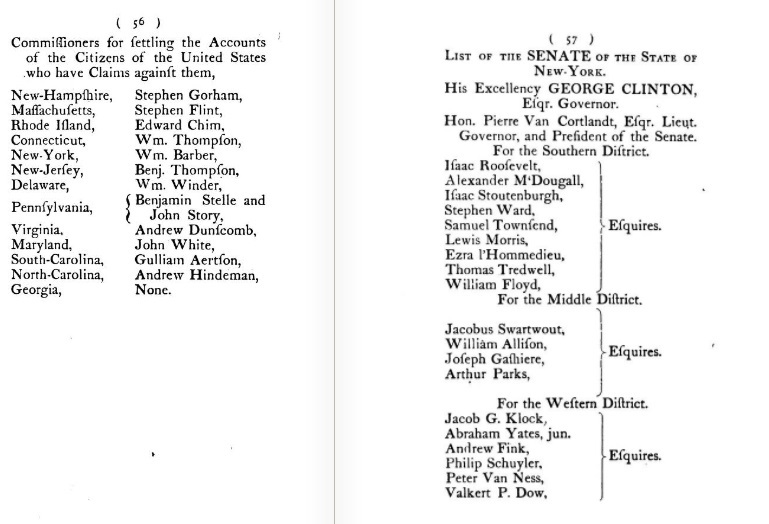 The neglect of settlement of important matters between the Commonwealth and the United States in Congress Assembled, relating to monies and averages. 18. Vote, this convention recommended to several towns in this county that they instruct their Representatives, to use their influence in the next General Court, to have emitted a bank of paper money, subject to a depreciation; making it a tender in all payments, equal to silver and gold, to be issued in order to call in the Commonwealth securities. 19. Voted, that whereas several of the above articles of grievances, arise from defects in the constitution; therefore a revision of the same ought to take place. 20. Voted, that it be recommended by this convention to the several towns in this country, that they petition the Governor to call the General Court immediately together, in order that the other grievances complained of, may by legislature, be redressed. 21. Voted, that this convention recommend it to the inhabitants of this county, that they abstain from all mobs and unlawful assemblies, until a constitutional method of redress can be obtained. 22. Voted, that Mr. Caleb Weft be desired to transmit a copy of the proceeding of this convention to the convention of the county of Worcester. 23. Voted, that the chairman of this convention be desired to transmit a copy of the proceedings of this convention to the county of Berkshire. 24. Voted, that the chairman of this convention be directed to notify a county convention, upon any motion made to him for that purpose, if he judge the reasons offered be sufficient, giving such notice, together with the reasons therefore, in the public papers of this county. 25. Voted, that copy of the proceedings of this convention is sent to the press in Springfield for publication. The Massachusetts county delegates directed that these grievances be sent to the counties of Worchester and Berkshire seeking support from neighboring communities in the heart of Massachusetts. They were hoping that this "grass root effort" would expand statewide forcing the legislature and the Governor to adopt measures to satisfy their grievances. Despite the call to "abstain from all mobs and unlawful assemblies," on the following Tuesday, 1500 insurgents assembled under arms at the Northampton Court House preventing the trial and imprisonment of debtors. The Governor of Massachusetts mobilized the militia "in the most feel­ing and spirited manner to suppress such treasonable proceedings." Little attention was given to the Governor's militia call and the counties of Worchester, Middlesex, Bristol and Berkshire were "set in flame and the tumult" threatening a general statewide rebellion. In the succeeding week the Courts of Common Pleas and General Sessions of the Peace at Worchester were surrounded by three hundred insurgents. The judges, although admitted to the door, were prevented entrance by a line of bayonets. The chief justice rebuffed the rioters on the "madness of their conduct" but the court was forced to retire to an adjacent house where trials were conducted. The violence of the mob, however, soon forced the court to adjourn altogether until the 21st of November. These actions were mirrored with a convention of delegates called from the towns of Middlesex County whose proceedings "very near resembled to those of their brethren in Hampshire." The rebellion was gaining steam and the armed insurgents had formed a defiant militia led by Daniel Shays, a former Revolutionary Army Captain. Mr. Gardoqui strongly insists on our relinquishing it. We have had many conferences and much reasoning on the subject, not necessary now to detail. His concluding answer to all my arguments has steadily been, that the King will never yield that point, nor consent to any compromise about it, for that it always has been, and continues to be, one of their maxims of policy, to exclude all mankind from their American shores. I have often reminded him that the adjacent country was filling fast with people, and that the time must, and would come, when they would not submit to seeing a fine river flow before their doors without using it as a highway to the sea for the transportation of their productions. That it would, therefore, be wise to look forward to that event, and take care not to sow in the treaty any seeds of future discord. He said that the time alluded to was far distant, and that treaties were not to provide for contingencies so remote and future. For his part, he considered the rapid settlement of that country as injurious to the States, and that they would find it necessary to check it. Many fruitless arguments passed between us, and though he would admit that the only way to make treaties and friendship permanent was for neither party to leave the other anything to complain of, yet he would still insist that the Mississippi must be shut against us. 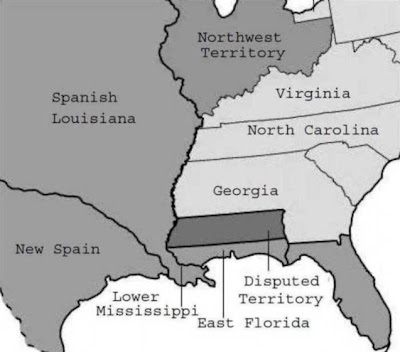 In addition to trade challenges there was also the border dispute of Spanish East and West Florida. In 1783, King George III ceded back East and West Florida that became Great Britain’s territory after winning the Seven Years War in 1763. Although the border was set at the 31st parallel in 1763, Great Britain moved it to 32°38′ latitude. In 1783 Great Britain in its concessions of the Floridas ceded it at the 31st parallel Spain contended after the war that the border remained at 32°38′ latitude. This border dispute, as one can well imagine, became a major contention between the United States and Spain. 1. Because, unless that matter can, in some way or other, be settled, the treaty, however advantageous, will not be concluded. 2. As that navigation is not at present important, nor will probably become much so in less than twenty-five or thirty years, a forbearance to use it while we do not want it is no great sacrifice. 3. Spain now excludes us from that navigation, and with a strong hand holds it against us; she will not yield it peaceably, and therefore we can only acquire it by war. Now, as we are not prepared for a war with any Power, as many of the States would be little inclined to a war with Spain for that object at this day, and as such a war would, for those, and a variety of obvious reasons, be inexpedient, it follows that Spain will, for a long space of time yet to come, exclude us from that navigation. Why, therefore, should we not (for a valuable consideration too) consent to forbear to use what we know is not in our power to use? 4. If Spain and the United States should part on this point, what are the latter to do? Will it, after that, be consistent with their dignity to permit Spain forcibly to exclude them from a right, which, at the expense of a beneficial treaty, they have asserted? They will find themselves obliged either to do this, and be humiliated, or they must attack Spain. Are they ripe and prepared for this? I wish I could say they are. It is possible that such an article, if agreed to, might lessen one of the arguments urged to enhance the value of western lands; but would not the Spaniards, continuing by force to exclude us from the navigation, soon have the same effect? In either case, that argument must lose some of its force; but in the one case America would lose some of its dignity. It can be no question, therefore, which of the two cases would be least desirable. If such a compromise should be attempted, and not succeed, we shall lose nothing by it, for they who take a lease admit the right of the lessor. I have some hopes that it would succeed, for I suspect that Spain would argue, that as we are tempted “to this forbearance” now by other articles in the treaty, the like temptations will again induce us to prolong it; besides, I much doubt whether the Minister extends his views far beyond the limits of his own life or administration; if he can render that easy and satisfactory, he may, perhaps, without much reluctance, leave future disputes to be settled by future Ministers. It is hard to say whether this will or will not be the case; I am for trying the experiment, because it can, in my opinion, do us no injury, and may produce much good. This treaty independent of the sacrifice I consider as a very disadvantageous one & such as we shod. not accept since it in reality gains us nothing & subjects to very high restrictions, such as exist in none of our other treaties although they are in effect bad enough. But they are to be justified especially those of France & Holland in the motives which led to them, to bring those powers into the war. …. The object in the occlusion of the Mississippi on the part of these people so far as it is extended to the interests of their States (for those of a private kind gave birth to it) is to break up so far as this will do it, the settlements on the western waters, prevent any in future, and thereby keep the States southward as they now are---;or if settlements will take place, that they shall be on such principles as to make it the interest of the people to separate from the confederacy, so as effectually to exclude any new state from it, to throw the weight of population eastward & keep it there, to appreciate the vacant lands of New York & Massachusetts. In short it is a system of policy which has for its object the keeping the weight of govt. & population in this quarter, & is pursued by a set of men so flagitious, unprincipled & determine in their pursuits, as to satisfy me beyond a doubt they have extended their views to the dismemberment of the govt. That the resolutions of the 20 July, 1785, and the 25th of August following, authorizing the Secretary of foreign Affairs to treat with Don Diego de Gardoqui respecting the boundaries and the Mississippi, in the words above recited, be and they are hereby repealed. That two commissioners be appointed and associated with the Secretary of foreign Affairs, with powers to enter into a treaty with Don Diego de Gardoqui, or such other person as his C. M. shall appoint, upon the following principles. Upon the Mississippi and the boundaries as above; but that they receive no proposition on the said points until he shall be authorized by his said Majesty to accede to the said terms. Seven states accepted Jay’s proposal but the Articles of Confederation required nine so the measure failed. James Monroe had successfully stalled John Jay’s treaty. Under this impression, Your Commissioners, with the most respectful deference, beg leave to suggest their unanimous conviction, that it may essentially tend to advance the interests of the union, if the States, by whom they have been respectively delegated, would themselves concur, and use their endeavours to procure the concurrence of the other States, in the appointment of Commissioners, to meet at Philadelphia on the second Monday in May next, to take into consideration the situation of the United States, to devise such further provisions as shall appear to them necessary to render the constitution of the Federal Government adequate to the exigencies of the Union; and to report such an Act for that purpose to the United States in Congress assembled, as when agreed to, by them, and afterwards confirmed by the Legislatures of every State, will effectually provide for the same. In New York that same fall, President Gorham's September Congress selected judges for hearing on yet another State boundary dispute. This time it was between South Carolina and Georgia. On September 14th Congress finalized Connecticut's land cession of their portion of the Northwest Territory. A few days later, they agreed to bar payment of USCA requisitions in paper money that "wasn't worth a continental". The action was followed with post­masters' orders "to receive no other money in payment for postage than specie." Not even the Federal Government had confidence in its backing of its own discontinued currency. In October, Congress turned to debating a third Ordinance for the Northwest Territory because the Ordinances of 1784 and 1785 had failed wretchedly to stabilize any orderly settlement of the Seven Ranges in Ohio. Also in October Congress elected James White southern Indian superintendent to confer with southern states. Other Gorham USCA measures included the adoption of an ordinance for settlement of the States' Continental accounts along with a law for establishment of a mint. That from the facts stated in the said letter from the Secretary at War, and other authentic information it appears that a dangerous insurrection has taken place in divers parts of the State of Massachusetts which is rapidly extending its influence; that the insurgents have already, by force of arms, suppressed the administration of Justice in several counties. The Secretary of War's report so alarmed the USCA that their attention turned away from the recommendations of the Annapolis Convention to discussions on how to end the rebellion. The October military measures passed by the USCA decidedly increased the military federal forces for the purpose of "Indian defense." The public relations label was designed to mask the seriousness of Massachusetts’ rebellion and the need for federal troops. Despite the resolution to help Massachusetts, the lack of money still weighed heavily on the USCA. The October 21st debate centered on the perils of raising an army to stop the rebellion only to be faced with the prospect; not being able to pay the newly commissioned U.S. Army. The United States was financially paralyzed and the Commonwealth of Massachusetts was forced to shoulder the bulk of the expense and troops necessary to put down Shays' Rebellion. The USCA, in its final months of 1786, also faltered on enacting legislation to revise the Articles of Confederation. President Nathaniel Gorham and his USCA would end the session failing to call for the May 1787 Philadelphia Convention, fail to muster an army to aid the State of Massachusetts and fail to assemble a quorum of its newly elected delegates in November and December. 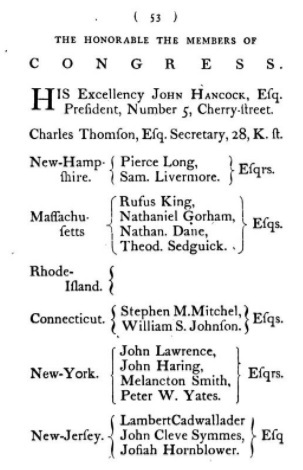 Once again the United States government was headless because Nathaniel Gorham, having served out Hancock’s term as President, returned to Massachusetts. 1786 would end with the federal government financially insolvent, the leading revolutionary state of Massachusetts in rebellion, the Northwest Ordinance still on the shelf, no convention called to revise the Articles of Confederation and no President to direct the affairs of State coming into the 1787 New Year. May 15, 1786 Elects Nathaniel Gorham chairman of Congress to succeed David Ransay. May 17 Ratifies Prussian-American treaty of commerce. May 18 Postpones to September meeting of agents for Georgia-South Carolina boundary dispute. May 22-25 Debates Connecticut cession. May 26 Declares conditional acceptance of Connecticut cession. May 29 Fails to achieve quorum. 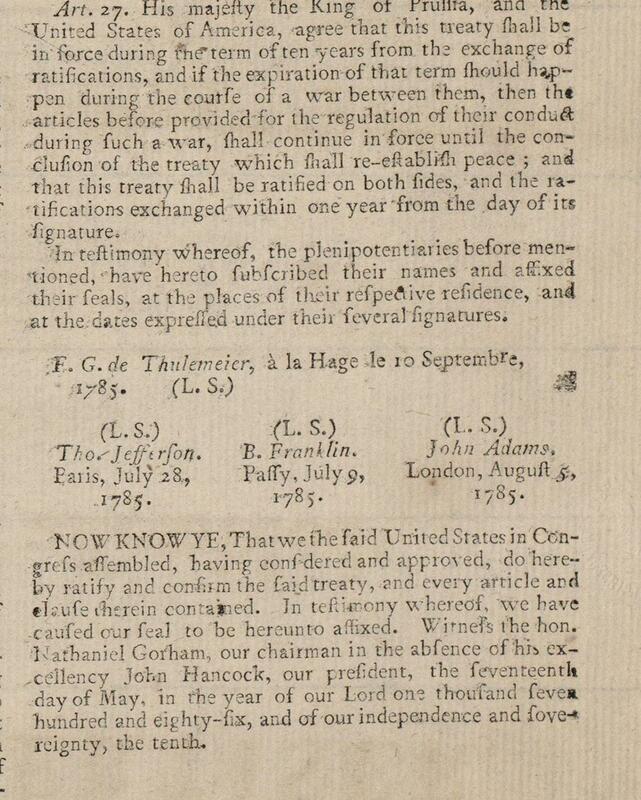 May 31 Amends rules to war; receives John Jay request for a committee to confer with him on negotiations with Diego de Gardoqui. June 5 Receives resignation of President John Hancock; receives report on military establishment. June 6 Elects Chairman Nathaniel Gorham president of the United States in Congress Assembled. June 13-14 Fails to achieve quorum. June 15 Receives reports on prospects for Indian hostilities and on Continental arsenals and magazines. June 16 Orders Indian commissioners to report on prospects for hostilities June 19-20 Fails to achieve quorum. June 21 Bans acceptance of paper money by post offices. June 22 Orders troop reinforcements "to the rapids of the Ohio." June 27 Directs court of appeals judges to reconvene November 6 and reinstates salaries on per diem basis. June 28 Receives draft ordinance for the Indian department. June 30 Responds to Virginia appeal for protection against western Indians. July 4 Celebrates anniversary of independence. July 7 Requests revision of Virginia cession to permit creation of "not more than five nor less than three" states from the northwest territory. 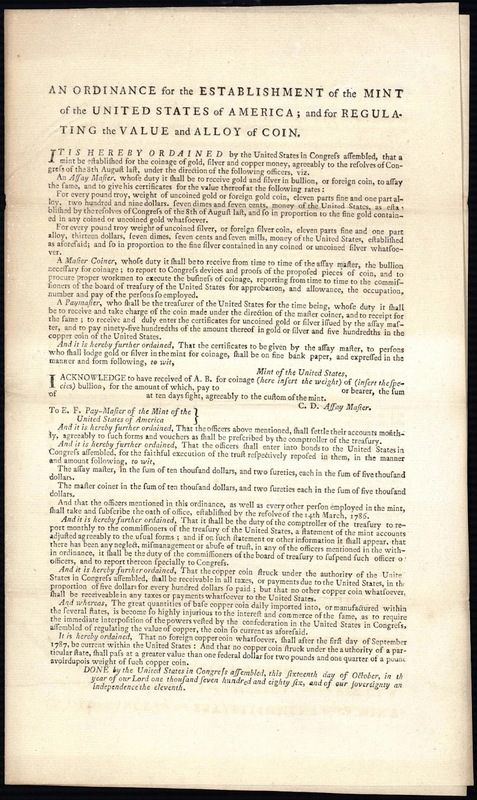 July 12 Revokes commissions of those appointed to negotiate treaties with the Indians. July 13 Recommits draft territorial plan of government. July 21 Debates Indian affairs ordinance. July 24 Orders second reading of Indian affairs ordinance July 27 Seeks revision of New York act authorizing Continental impost. August 1 Receives report on arsenals and ordnance. 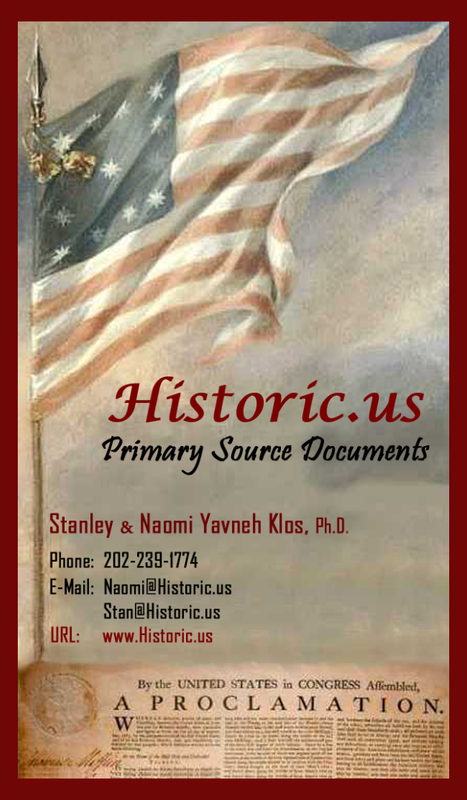 August 2 Adopts 1786 requisition. August 3 Authorizes purchase of West Point; confers with secretary for foreign affairs on negotiation of treaty with Spain. August 7 Adopts Indian affairs ordinance. August 8 Adopts coinage standards; orders board of treasury to report an ordinance for establishment of a mint. August 9 Appeals to North Carolina, South Carolina, and Georgia for land cessions. August 10 Debates John Jay's instructions for negotiating Spanish treaty. August 14 Appoints committee to meet with Pennsylvania Assembly on revising act authorizing Continental impost. August 16-23 Debates John Jay's instructions for negotiating Spanish treaty. August 24 Orders relief for displaced Moravian Indians. August 28 Debates John Jay's negotiating instructions. August 29 Repeals John Jay's negotiating instructions by seven-to-five vote (which was contested on the ground that nine votes were constitutionally required). August 30-31 Debates repeal of John Jay's instructions. September 1-2 Debates repeal of John Jay's instructions. September 4 Convenes agents for appointing a court to hear South Carolina-Georgia boundary dispute. September 5 Authorizes settlement of Pennsylvania fiscal claim. September 11 Receives South Carolina appeal for congressional intervention in hearing boundary dispute with Georgia. September 12 Receives John Jay report on consular convention with France. September 13 Selects judges for hearing South Carolina, Georgia boundary dispute. September 14 Accepts Connecticut land cession. September 18 Bars payment of Continental requisitions in paper money. September 20 Receives report on Annapolis Convention; orders postmasters "to receive no other money in payment for postage than specie." September 25 Receives report on conference of congressional committee with Pennsylvania Assembly. 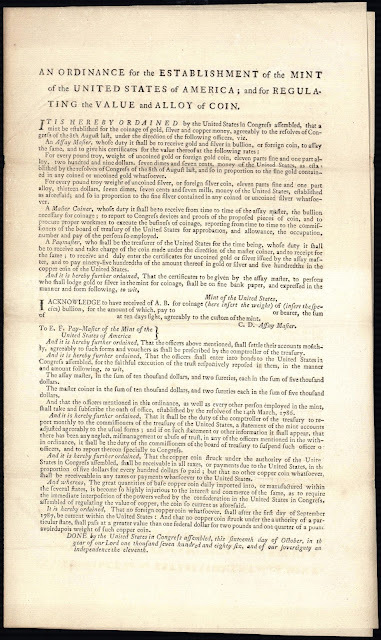 September 28 Debates repeal of John Jay's negotiating instructions. September 29 Debates ordinance for territorial government. October 3 Instructs Thomas Jefferson on renegotiation of consular convention with France. October 4 Debates Northwest ordinance. October 6 Elects James White southern Indian superintendent. October 10 Directs Indian superintendent to confer with southern states. October 13 Adopts ordinance for settlement of the states' Continental accounts; receives report on British response to request for evacuation of frontier posts. October 16 Adopts ordinance for establishment of a mint. October 18 Receives secretary at war's report on Shays' rebellion. October 21 Increases military establishment - ostensibly for Indian defense but with an eye to the "disorders" in Massachusetts. October 23 Appeals to states for authority to regulate trade; authorizes secretary for foreign affairs to inspect the mails for reasons of national security (excepting the mail of members of Congress). October 26 Orders inquiry into postal service. October 30 Authorizes suspension of interest credits on Rhode Island-held debt in retaliation for state paper money policy. November 1-2 Debates postal reform. November 3 Adjourns - referring "the several matters now before Congress" to the new Congress scheduled to meet "on Monday next" November 6 Convenes - five states represented November 7-24 Fails to achieve a quorum. 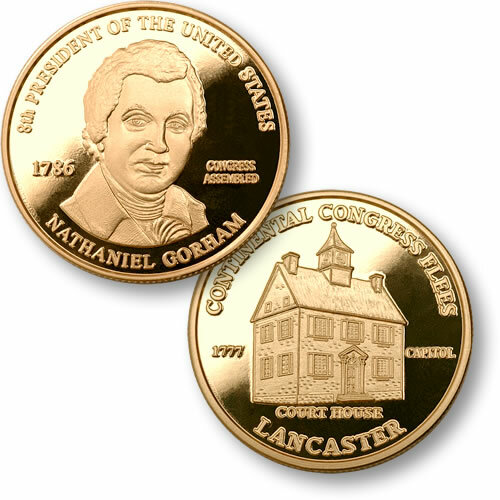 November 13 - Nathaniel Gorham's term as President ends. In Massachusetts after his presidency, Gorham served as a judge for Middlesex County's court of Common Pleas. He was elected to represent Massachusetts in the Philadelphia Convention that his USCA failed to call. Nathaniel Gorham would exert a powerful influence in securing the second U.S. Constitution’s ratification in the Massachusetts State Convention. Ratification was won only when Gorham and other Federalists proposed possible amendments to the Constitution to attract the moderates who held the deciding votes. Unfortunately, former President Gorham did not serve in the new government he helped to create deciding, instead, to engage in precarious entrepreneurial pursuits. In connection with Oliver Phelps, Gorham purchased from the State of Massachusetts, in 1786, an immense tract of land on the Genesee River, for the sum of $1,000,000 secured by a large mortgage. This had been previously ceded to Massachusetts from the State of New York. They settled the Native American title to a part of this territory, surveyed it into tracts, laid out townships, and sold large parts to speculators and settlers. Sales, however, were not nearly as good as Gorham had hoped. A large mortgage on the parcel still remained when Massachusetts scrip rose dramatically in value in 1788/89, enormously swelling the mortgaged portion of the vast tract. By 1790, Gorham and Phelps were unable to fulfill their contract in full to Massachusetts. They surrendered that a large portion of the land as settlement but the partners never recovered from the insolvency. Like Robert Morris in Philadelphia, the former President fell from the pinnacle of society and lost all his political esteem. At the age of 58 on the 11th of June, 1796 he died a financially broken man and was buried at the Phipps Street Cemetery in Charlestown, MA. Early activists in the colonies called themselves "Whigs", allying themselves with the Great Britain's Radical Whigs who did much to stimulate colonial republican sentiment during the Revolutionary War. Journals of the USCA, June 6, 1786. Journals of the USCA, August 29, 1786.